Home / Cat Health Care • Cats And Vets / Is Your Vet Cat Friendly? The one thing I love about our vet is that she’s cat friendly. She has a separate exam room for cats. She sits on the floor with them. And she would never drag a terrified cat out of its carrier. 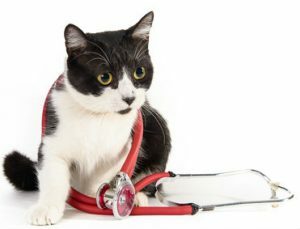 My vet might be the exception, but the American Association of Feline Practitioners is trying to change that with its Cat Friendly Practice program. And, according to a recent AAFP survey, catering to cats doesn’t just eliminate the dread of vet visits, it’s good for business. Studies show that cats get less health care than dogs do. There are probably many reasons for that. But the one that comes to mind first is the sheer difficulty of getting most cats to the vet. The first obstacle is getting a recalcitrant cat into a carrier. Then there’s the terrifying vet visit itself. Many people think as long as the cat seems happy and healthy, a vet visit’s just not worth the stress. And if your cat is very fractious and difficult to handle, the vet might secretly thank you for that decision. The Cat Friendly Practice program aims to eliminate that misery for everyone. These are some of AAFP’s requirements for Cat Friendly Practice designation. Your vet could — and should — do many of these things, even if she isn’t a designated cat friendly practice and doesn’t want to become one. Provide separate waiting areas for dogs and cats. If the clinic is too small for separate waiting areas, other suggestions include taking cats into an exam room as soon as they arrive or letting cats and their people wait in the car until the vet is ready to see them. Set aside an exam room that’s used only for cats. Put a soft mat or fluffy towel on the exam table. In addition to a towel, my vet has wicker cat beds on hers. Provide a separate area for cats who are boarding or need to be hospitalized. The cat cages should have soft bedding and a box or other place to hide. Use pheromone diffusers, which create a “friendly” scent for cats. Also spray towels and bedding with synthetic pheromones. Cat friendly vets and technicians speak softly, move slowly and let the cats take a break if they’re stressed. Handle cats gently instead of using restraint. Cat friendly vets will let cats stay in their carriers, if they’re more comfortable that way. Or they’ll sit on the floor with them or hold them in their laps. My vet examined one of my cats while he was curled up in a sink! Cat friendly practices have at least one cat advocate who ensures the staff treats cats gently and with respect. The cat advocates also answer clients’ questions about cat care. While a designated cat advocate may be helpful, the real advocate for your cat’s health is you. If your cat and you will be more comfortable waiting in the car until the vet is ready to see you, let the clinic staff know that’s your plan. Expect and demand gentle handling with no restraints. Insist on medication your cat will take without a major struggle. Liquid medicine is usually easier to give and disguise than pills. And many medications can be compounded into a gel you’d rub inside the cat’s ear tip. If your cat has a chronic illness, learn all you can about it in Facebook groups and email lists and use your knowledge as talking points with your vet. Vets treat many conditions and species, and they can’t be experts on everything. It’s up to you to become an expert so your cat will get the best possible care. Looking for a vet with the Cat Friendly Practice designation? There’s a list on AAFP’s website.